In close race, having a good organization can be crucial. But it isn't make-or-break. Look at all the seats the Bloc lost in Quebec in 2011, despite spending tens of thousands of dollars and having teams on the ground. So, we'll see! 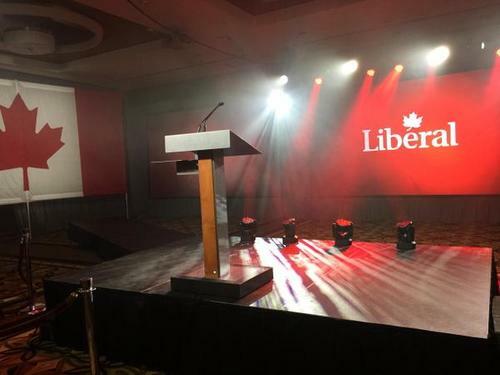 Aside: I was told by a Liberal candidate who has worked VERY HARD on her ground game in this race that she was only counting on the national campaign/leader's strength for the last five per cent or so of lift in her numbers. Everything else she needed to do on the ground: door knock, get out there in the community, have a strong local message, identify her voters and then get them to turn out. I hear a lot of people say this. What say you, Mr. Grenier? The odds of being polled are very, very low. The odds of being one of the 1,000 people polled in a standard poll is about 0.004%. At least, considering the 25 million or so voters that are eligible to case a ballot tonight. This is the perfect question for a poll analyst - how about it, what was it exactly that shook up the log jam in the numbers that we saw until a few weeks ago? At the outset of this campaign, the largest block of voters up for grabs was Liberal-NDP swing voters. So, there has been a bandwagon effect of voters going to the Liberals from the NDP, because for a large proportion of these voters the top priority was a change of government. What bumped them from 1st place to 3rd? It was a number of factors, but I think the niqab debate hurt them in Quebec enough to bump them from that 3-way race, which then had the effect of pushing swing voters to the Liberals. But will the NDP's supporters defy the pollsters? They could - especially if they believe that the Liberals have this in the bag. Thank you so much for being here Éric - he has to run to get ready for the radio special (starts in a few short minutes!) But he'll be back around 8:30 p.m. if you have more questions for him. Thanks! Lots to talk about when I get back. Those asking why their question didn't show up: Because we get dozens and dozens of questions. We couldn't possibly take them all. But thank you for sending them in. We have other guests this evening, so plenty of opportunities to take part. The Conservative Party’s headquarters are in Calgary. 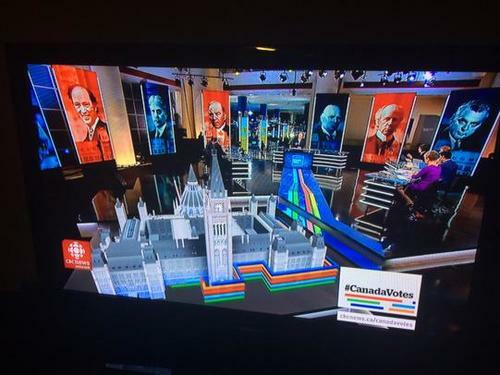 The CBC’s Susan Lunn is reporting from that campaign. Like the NDP’s HQ, it too has been scaled down from past elections. Lunn estimates the room is about a quarter of the size as it was in 2006, when the Conservatives won their first minority government under Harper’s leadership. Like the NDP, the Liberal Party headquarters are also in Montreal tonight. The CBC’s Susan Ormiston is covering that campaign. She reports that the Liberals are feeling good leading up to the results. There is bound to be some incumbent members of Parliament who lose their riding tonight. If an incumbent does not get re-elected, they have 17 days to vacate their parliamentary offices in Ottawa. If you're wondering... Canada doesn't have exit polls the way our American friends do. So there's no quick hit for the junkies in the form of previewed results when the polls close. However, Newfoundlanders have nearly finished having their say, so the earliest of the early results will be coming in soon. Policy analyst Graham Fox, president and CEO of the Institute for Research on Public Policy, was a guest on Power & Politics tonight. He chatted about what happens if Canadians elect a minority government tonight. Host Rosemary Barton asked Fox how long he thought a minority government would last. Fox was hesitant to say. The first seven seats up for grabs in this PARLIAMENT (not government, Parliament) we're electing tonight come from NL. Watch live speeches from the major parties in the “Live Streams” section of our results page. Stay tuned for updates through the night. The polls have just closed in NL. 331 ridings still voting! Hi Janice - it's a pleasure to be here! We've invited him to join us for a while this evening because his specialty is Canadian judicial and constitutional issues... and I can tell you over the last few weeks as people have started to ponder the likelihood of a minority government scenario, there have been a lot of questions and some confusion out there about what this means. But seriously, minorities can be a bit more exciting and less straightforward than a straight up majority seat count. Let me start with a common question for you Andrew: if there isn't a majority, when will we really know who will be governing this country? The whole election process isn't finally over until a majority of the newly elected MPs vote confidence in a new government. But a lot depends on how closely the parties finish in the seat counts, and what the various opposition party leaders have to say about whom they're prepared to supprot - or *not* support. If no-one wins a majority then, the first question is whether the incumbent Prime Minister thinks he has a realistic chance of wooing enough MPs to his party's side. If he does, he can remain in office and try to win the all-important first vote of confidence. If her loses it, then he theoretically has the choice of resigning to let another leader try to win a majority - or her could advise and election. to support a government led by one or the other party, then the GG has no cho0ice but to appoint the leader of that party as the next PM.